The earliest date on Bill of Lading is the date of completion of customs formalities of respective country. As you know, any movement of goods from a country have to be approved by the government of respective country. Customs department is the government agency appointed to regulate and implement the procedures and formalities of imports and exports. Once after filing the required legal documents for completing the procedures for exports, customs department allows the goods to move out of country after necessary verification of documents and goods wherever applicable. 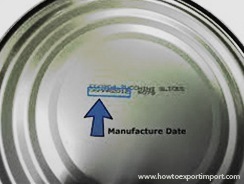 In India, the final completion of customs formalities in export are called “Let Export” order. Once obtained ‘let export’ from the concerned customs officials, the cargo can be handed over to shipping carrier for movement of goods. Shipping carrier is the person or company who carries goods to final destination. A carrier is authorized to move the goods out of country only after the permission by the concerned customs department. Customs broker or exporter completes the procedures and formalities by filing necessary documents as mentioned above. Once after obtaining the legal customs documents proving the completion of customs formalities the shipping carrier moves the goods. Here the earliest time of movement of goods authorized to shipping carrier by customs department is the time of completion of customs procedures and formalities. The carrier can issue Bill of Lading, only when he receives goods from the shipper legally. The carrier can receive goods for export only after completion of customs formalities. The carrier issues Bill of Lading to shipper on receipt of goods actually received, after completion of customs formalities. So, it is clear that a carrier (shipping company or freight forwarder) is authorized to issue bill of lading only after completion of export customs procedures and formalities. So the earliest date of Bill of Lading is the date of completion of export customs formalities of the said country. The BL date and the date of completion of customs formalities can be on the same day. Samual: On 14 December 2013 There's certainly a lot to know about this topic. I really like all the points you've made.